Over the past 48 hours local media in Michigan's UP (upper peninsula) have been reporting on a health department investigation into a cluster of severe adenovirus cases that have seen at least 6 adults hospitalized, 2 in intensive care. I was first alerted to this story by Shiloh on FluTrackers, who posted the following brief media report overnight. Public Health, Delta & Menominee Counties, Marquette County Health Department and the Michigan Department of Health and Human Services (MDHHS) are investigating a cluster of severe respiratory illnesses associated with adenovirus infection in individuals residing in Michigan’s central Upper Peninsula (U.P.). Currently, all six of the patients with confirmed adenovirus infection are adults who have been hospitalized, two of whom have received intensive care. Additional reports of illness are being investigated and laboratory testing is ongoing in order to more fully describe the virus that is causing illness. This led me to the full announcement from the Western U P Health Department. After the break, I'll return with more on adenoviruses. August 31, 2018: Public Health, Delta & Menominee Counties, Marquette County Health Department and the Michigan Department of Health and Human Services (MDHHS) are investigating a cluster of severe respiratory illnesses associated with adenovirus infection in individuals residing in Michigan’s central Upper Peninsula (UP). Currently, all six of the patients with confirmed adenovirus infection are adults who have been hospitalized, two of whom have received intensive care. Additional reports of illness are being investigated and laboratory testing is ongoing in order to more fully describe the virus that is causing illness. 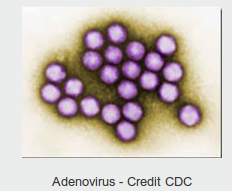 Adenovirus is a common cause of cold-like illnesses seen every year, but it can also result in a more serious illness, such as bronchitis and pneumonia. These more significant infections occur most frequently in those with immune compromising conditions or underlying respiratory disease. Just like flu, it is easy to pass adenovirus infections from person to person through coughing and sneezing. People can also come in contact with the virus by touching surfaces where the virus has landed–like doorknobs and other hard surfaces and then touching the moist parts of their eyes, nose or mouth. As during flu season, we remind people that big public spaces, such as schools, stores and churches, are easy places to spread infections. Several (but not all) of the ill people reported The Island Resort and Casino in Hannahville, MI, as a common exposure. The casino has been undertaking extra cleaning measures to reduce the possibility of transmission in that setting. Public health encourages people to use the same prevention strategies recommended throughout the year and especially during cold and flu season: stay home when you are ill, cough into your sleeve, wash your hands frequently and especially before eating and contact your healthcare provider if you are concerned about your symptoms. Individuals who have lowered ability to fight infections, have chronic respiratory problems like COPD and asthma, and those who smoke are at higher risk for more severe illness when they get respiratory infections and should aim to reduce their exposure to sick individuals. At this time, there is no vaccine available to prevent adenovirus infections. People ill with respiratory symptoms should contact their healthcare provider as they normally would, if they are concerned about the severity of their symptoms. Local public health and the Michigan Department of Health and Human Services (MDHHS) will continue to monitor the situation. As we are in the midst of a long Labor Day weekend, it may be a few days before we learn more. For now, the strain has not been identified. Adenoviruses - of which there are more than 4 dozen serotypes - are a common cause of (generally mild) respiratory illnesses in both adults and children. While influenza gets most of our attention, adenoviruses - like human rhinoviruses, human metapneumovirus, RSV, parainfluenza viruses & coronaviruses - can, and sometimes do, cause serious illness. To give you an idea of how common some of these viruses really are, a little over four years ago Dr. Ian Mackay produced the following graphic on his VDU blog. 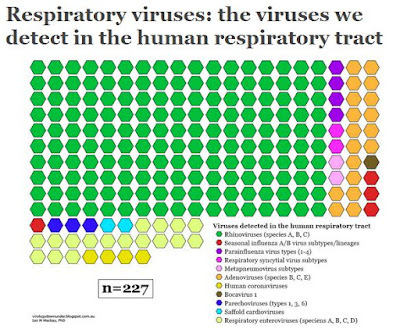 As you can see, adenoviruses (in orange) were more commonly detected than influenza (red). We've looked at severe adenovirus outbreaks in the past, including a multi-state outbreak of virulent serotype Ad14 a dozen years ago (see 2007 MMWR Acute Respiratory Disease Associated with Adenovirus Serotype 14 --- Four States, 2006—2007) and in 2012, China: Hebei Outbreak Identified As Adenovirus 55. In 2016, we looked at a report in the EID Journal: Human Adenovirus Associated with Severe Respiratory Infection, Oregon, USA, 2013–2014, that described a relatively large outbreak in the Pacific Northwest. During October 2013–July 2014, Oregon health authorities identified 198 persons with respiratory symptoms and an HAdV-positive respiratory tract specimen. Among 136 (69%) hospitalized persons, 31% were admitted to the intensive care unit and 18% required mechanical ventilation; 5 patients died. Molecular typing of 109 specimens showed that most (59%) were HAdV-B7, followed by HAdVs-C1, -C2, -C5 (26%); HAdVs-B3, -B21 (15%); and HAdV-E4 (1%). Molecular analysis of 7 HAdV-B7 isolates identified the virus as genome type d, a strain previously identified only among strains circulating in Asia. Patients with HAdV-B7 were significantly more likely than those without HAdV-B7 to be adults and to have longer hospital stays. HAdV-B7 might be reemerging in the United States, and clinicians should consider HAdV in persons with severe respiratory infection. Outbreaks of Ad in the general population have been characterized by infection due to novel viruses such as Ad7h, Ad7d2, Ad14a, and Ad3 variants. These novel viruses are sometimes associated with high attack rates and a high prevalence of pneumonia. Severe mortality is also prevalent among patients with chronic disease and in the elderly. One of the most important novel serotypes, Ad14, previously rarely reported, is now considered as an emerging Ad type causing severe and sometimes fatal respiratory illness in patients of all ages (45). Beginning in 2005, Ad14 cases were suddenly identified in four locations across USA (46); the strain associated with this outbreak was different than the original Ad14 strain isolated in 1950s. The novel strain, Ad14a, has now spread to numerous US states and is associated with a higher rate of severe illness when compared to other Ad strains. Novel Ad species have also been recently detected in cross-species infections from non-human primates to man in USA and between psittacine birds and man in China (47). These cross-species infections indicate that Ads should be monitored for their potential to cause cross-species outbreaks. In a recent review of the risks of potential outbreaks associated with zoonotic Ad (48), it was noted that intense human–animal interaction is likely to increase the probability of emergent cross-species Ad infection. Additionally, the recombination of AdVs with latent “host-specific” AdVs is the most likely scenario for adaptation to a new host, either human or animal. Currently, there are no FDA approved antivirals for Ad infection; however, the best antiviral success has been seen with ribavirin, cidofovir, and most recently brincidofovir an analog of cidofovir (49). If you haven't read this entire article, I highly recommend it. While influenza is a perennial winter visitor, every few years - often during late summer of early fall - we'll we'll see a non-influenza respiratory virus make headlines. Most are small and localized, but in August of 2014, it was a nationwide outbreak of Enterovirus D-68. While causing mostly mild-to-moderate respiratory illness, EV-D6 was also linked to an increase in neurological illnesses, including limb weakness or AFP (Acute Flaccid Paralysis) (see CDC HAN: Acute Neurologic Illness with Focal Limb Weakness of Unknown Etiology in Children). The nature of these viruses is that they are constantly evolving, and so their threat to public health can change over time. Although it isn't quite flu season, it's a good idea to practice rigorous `flu hygiene' (washing hands frequently, covering coughs, staying home if sick, etc.) year-round. But even doubly so, when we start getting reports of severe respiratory outbreaks such as being reported from upper Michigan. So stay tuned . . . and pass the hand sanitizer.